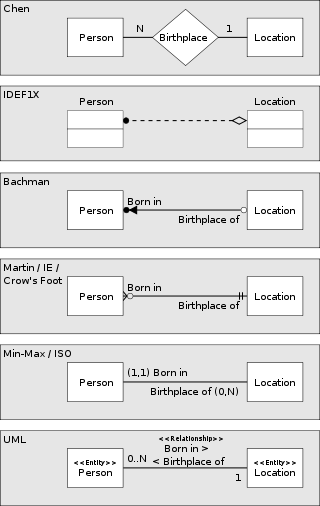 ^ a b "The Entity Relationship Model: Toward a Unified View of Data" for entity–relationship modeling. ^ "English, Chinese and ER diagrams" by Peter Chen. ^ Kent in "Data and Reality" : "One thing we ought to have clear in our minds at the outset of a modelling endeavour is whether we are intent on describing a portion of "reality" (some human enterprise) or a data processing activity." ^ In Jackson's words: "The developer begins by creating a model of the reality with which the system is concerned, the reality which furnishes its [the system's] subject matter ..."
^ "UML as a Data Modeling Notation, Part 2"
^ M. L. Brodie and J. T. Liu. The power and limits of relational technology in the age of information ecosystems. On The Move Federated Conferences, 2010. ^ A. Badia and D. Lemire. A call to arms: revisiting database design. SIGMOD Record 40, 3 (November 2011), 61-69. ^ Gregersen, Heidi, and Christian S. Jensen. "Temporal Entity-Relationship models—a survey." IEEE Transactions on Knowledge and Data Engineering, 11.3 (1999): 464-497. ^ RICCARDO TORLONE (2003). “Conceptual Multidimensional Models”. In Maurizio Rafanelli. Multidimensional Databases: Problems and Solutions. Idea Group Inc (IGI). ISBN 978-1-59140-053-0. http://torlone.dia.uniroma3.it/pubs/idea03.pdf. Bernhard Thalheim (2000). Entity-Relationship Modeling: Foundations of Database Technology. Springer. ISBN 978-3-540-65470-4. Sikha Bagui; Richard Earp (2011). Database Design Using Entity-Relationship Diagrams (2nd ed.). CRC Press. ISBN 978-1-4398-6176-9.